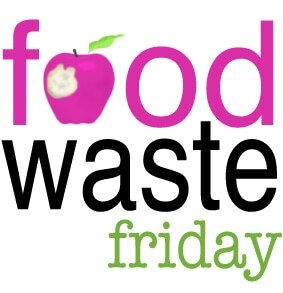 This is my first week participating in the Food Waste Friday (albeit a day late). I was really dreading my confession time. I had to throw out a lot of things…though I did have some good saves too. 2 cabbages that had soured, a small bag of collards, a couple of small eggplants, 2 tomatoes and a handful of cherry tomatoes (all these from the garden). I also threw away 1/2 a container of salsa that I’d gotten from Sam’s Club that we didn’t care for, some black bean and corn salsa that I’d been eating on for a week, 1/2 a jar of homemade strawberry syrup that looks like a spot of mold got on it, 1/2 a carton of whipping cream (out of date), 2 slices of Swiss cheese that were suspicious, and worst of all 2 quarts of home made yogurt that is too grainy because I overheated the milk. *sigh* 😦 It’s shameful all this waste! A very ripe tomato was sliced and added to dinner plates one night, a couple of very ripe bananas were topped with peanut butter for a snack, some salad lettuces from the garden were on the verge of going that were saved by having dinner salads, some black beans were frozen for later use, some home made rolls were processed into bread crumbs and frozen for later use. Some celery was diced and frozen for later use. I did use up 2 flour tortillas by making breakfast burritos one morning.